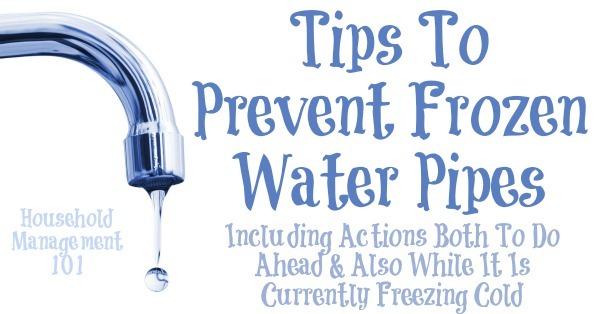 Here are tips to prevent frozen water pipes in your home when the temperature outside dips down extremely low. There are really two types of tips that you should consider. 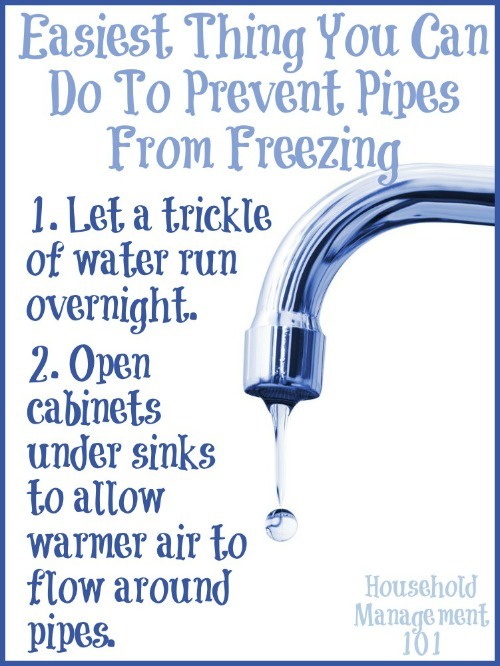 The first have to do with things you can do if it is currently cold, to prevent the pipes from freezing RIGHT NOW. Those two things are listed below in this infographic. To explain, briefly, why these things work you need to understand what happens when water freezes, which is that it expands. Not only can the expanding water (i.e. ice) make your pipe burst, but even if it doesn't, the build up of pressure behind the blockage from the water that cannot flow can also cause a pipe to burst. Flowing water can also freeze, but often doesn't as easily, so letting a trickle through, does two things. First, that trickle keeps the water from freezing as easily, and second, that little trickle can help relieve the water pressure from building too high in the pipe if a partial block occurs. Both things help prevent pipes from busting, which is a very good thing. When some people have heard this suggestion though they've protested, saying this sounds like a water of water. But please note when I say a trickle, I really mean a trickle, not a steady stream! The trickle of water can be very small, so you're not wasting as much as some people fear. And if you really hate wate just place a bucket in that sink to collect the water so you can use it later, somewhere around your home. But that small trickle does so many positive things, and can help make sure the pipe doesn't burst, which is such a much costlier thing to fix that it seems like a good trade off to me. In regard to opening your cabinets under sinks to allow warmer air to circulate this is pretty self explanatory. Let your heating help keep the pipes in exposed areas, such as under sinks, from freezing. The big caution about this tip is just to think of safety when you do it. If you normally have things stored inside these cabinets that children or pets should not get into, you'll need to exercise caution when you have them open to let the air circulate. Perhaps move some of those items temporarily to another location, for example. If frozen water pipes are a problem for you, or a problem in your area, as always prevention is the best cure. Unfortunately, we don't often think of these things until it is actually freezing outside. But if you're worried about freezing pipes now then go ahead and learn what you should do in the future to help prevent the problem. Because unfortunately, depending on how your home is constructed, if you don't have proper insulation around your pipes they still may freeze even with taking the two steps listed above. The biggest preventative step to do before cold weather strikes is to properly insulate your pipes so that they are not as exposed to cold air, and therefore less likely to freeze up. Here's a quick video from This Old House which gives some good preventative tips, plus a few ideas for how to thaw out pipes that have become frozen before they burst because burst pipes are a messy, expensive problem!